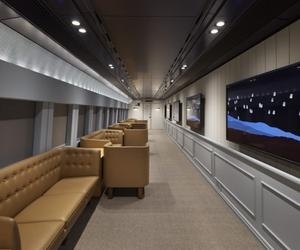 Japan’s major passenger railway company JR East has just launched what officials call “the world’s fastest art experience” with a traveling art gallery aboard one of its bullet trains, or shinkansen. Zipping at speeds up to 200 miles per hour, a train named “Genbi Shinkansen” on the Jōetsu Shinkansen line now holds a group exhibition of contemporary works by six Japanese artists, the Japanese collective Paramodel, and New York-based artist Brian Alfred. Individual carriages of the train, which runs through the Niigata prefecture, are devoted to different artists, and the included art all relates to the region’s landscape and culture or, more broadly, to the notion of traveling. The photographer Mika Ninagawa’s images actually cover the train’s exterior, showing views of an annual fireworks festival held in Nagaoka City. Inside, Alfred contributes an animation compiled from images of sceneries he’s seen while traveling; photographer Naoki Ishikawa shows picture of lagoons in Niigata. In a curious coincidence, France’s own national rail service SNCF also just revealed a collaboration with 3M and the Musée d’Orsay that involves covering the inside of one of its trains with impressionist art through a film that plays on the ceiling of its cars. The launch intends, in part, to show the relationship between railways and the art movement: specifically, to reflect on the inspiration artists drew from landscapes. Images shown include works drawn from the collection of the Musée d’Orsay, such as Pissarro’s “Morning, Sun” and Monet’s “Blue Water Lilies”; a view of the Palace of Versailles; and scenes shot by Gaumont Film Company — the world’s first film company. The two train projects join the ranks of city transit services worldwide attempting to make our daily commutes more interesting and inspirational. 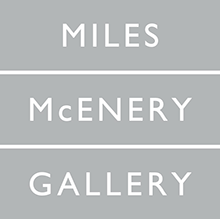 In New York City, aside from filling stations with mosaic art, the MTA’s Arts & Design program commissions artists each year to design posters that hang next to advertisements in cars; the Poetry in Motion series also displays verses on their moving walls. Similarly, London has Art on the Underground; most of its commissions typically decorate station platforms, but the programming is active and strong, featuring live performances as well as temporary exhibitions that have included contributions from Sarah Lucas, Lawrence Weiner, Wolfgang Tillmans, and Trevor Paglen. While the endeavors in Japan and France aren’t as tightly curated, they are creative solutions to inject art into our everyday routines.